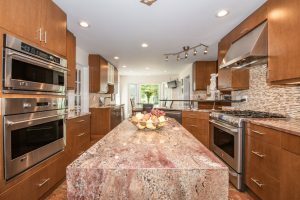 Kitchen counters provide a surface for a variety of activities. From food preparation to family gatherings, the kitchen counters are constantly in use and provide an opportunity to showcase your home’s style. Professional installation is key because the counters need to be cut and glued together to go around sinks and other appliances perfectly. Replacing worn, broken or outdated countertops can boost the look and functionality of the kitchen. Traditional countertops are constructed using manmade materials, such as bauxite with pigments or plastic resin. The manufacturing process includes pouring the material into a mold and using chemicals and heat to cure it until solid. The non-porous surface created can be layered on top of itself for a thicker countertop. Resistant to scratches and heat, the material comes in a variety of colors and prevents bacteria growth and water damage. One of the latest solid surface materials used is LG’s Hi Macs. By curing at 320-degrees for a second time, the material has a higher heat resistance. With this type of surface, you no longer need to worry about placing a hot pan or pot directly on the countertop. The fifteen-year warranty is also a nice bonus. Corian by DuPont uses a specialty pigment and their proprietary formula and comes in 130 designs and colors. The solid surfaces are verified and guaranteed to resist bacteria by the American National Standard Institute. The ten-year warranty and food contact certification make these a great choice. With a 96 percent satisfaction rating, their customers seem to agree. Countertops provide a place to gather, store and prep food. The style and material chosen affects the life and functionality of the counters. With all the use the kitchen receives at any given time, having quality counters that hold up to heavy use is important. The reasonable cost of solid surface materials is a nice alternative to their more expensive natural alternatives, such as granite and stone. Brightening the look of your kitchen doesn’t have to break the budget.